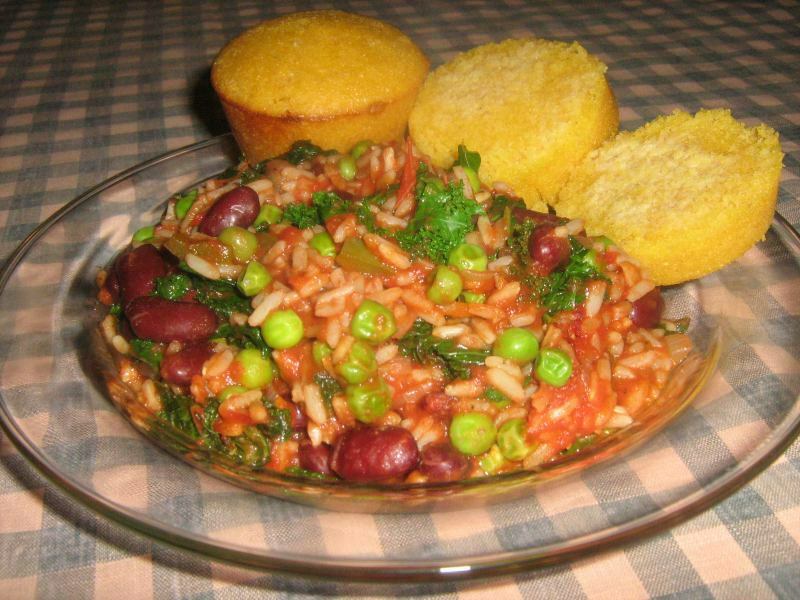 This Southern style rice and beans recipe quickly becomes a great one-dish meal with the addition of peas, green peppers and kale! Southern Style Rice and Beans is a delicious way to add a healthy bit of protein to your diet. And it really is a complete meal when combined with delicious kale, peas, some applesauce and cornbread muffins! We also added a few sliced baby bella mushrooms for more flavor and texture. This one-dish recipe is a complete, balanced dinner meal! Heat the olive oil in a large saucepan or skillet, over medium heat. Add the garlic and onion and sauté for about 5 minutes or until tender. Add the green pepper and continue to sauté for another 3 minutes. Stir occasionally. Add the rice to the saucepan and mix thoroughly. Then add the water and mix again. Bring to a boil then reduce the heat to a low simmer, cover and allow to cook for 5 minutes. Add the tomatoes, salt, Cayenne pepper, paprika and marjoram. Stir to mix well. Keep covered and allow to cook for another 12 to 14 minutes, or until the rice is somewhat tender. Stir in the peas, kale and beans, return to cover and cook for another 5 to 8 minutes or until the rice is tender and the vegetables are heated through. Serve with a side of applesauce and some freshly baked corn muffins. Note: Feel free to adjust the amount of Cayenne to suit your taste...you may like it hotter than this recipe makes it. Also try adding a teaspoon of red pepper flakes to the mix right before the last 5 to 8 minute cook time.